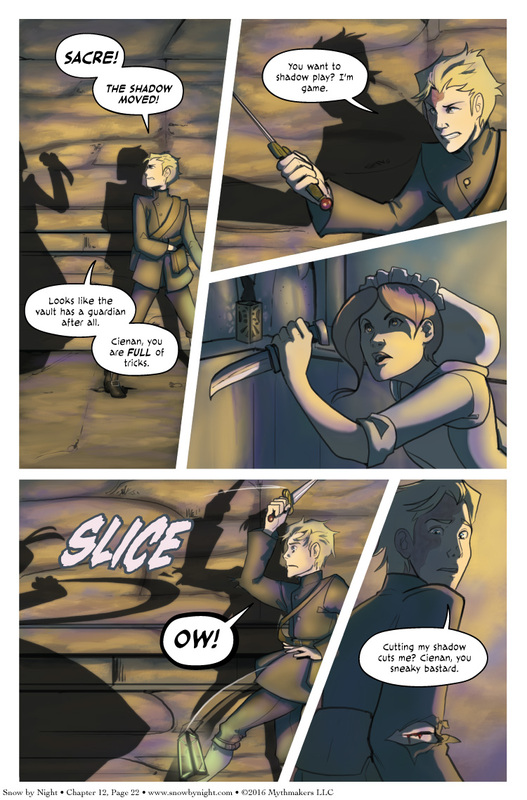 The shadow takes a bite out of Jassart on Chapter 12, Page 22. As many of you predicted, it is another one of Cienan’s traps. The upcoming scene is a great example of how Julie and I work together. Julie draws the page based on my script. A lot of times I then go back in and rewrite some of the dialogue to ft the action sequences. It’s kind of a modified Marvel style. I’m pretty happy with it. Julie comes up with great ways to express scenes visually and the language can adapt to it. But that’s how he wins. It looks to me like this page is missing from your RSS feed. Also, the copyright notice in the image says 2015. (That could be intentional if that’s when you drew it, but as long as I’m bringing up off-topic technical issues I thought I would throw it in, everyone can hate me for it all at once that way!). Who wants to play shadow puppets? This seems a terribly easy trap to defeat. Assuming Jassart can’t out-fight her (maybe the effect works in just one direction), he can just run up to the lantern (instantly making himself a giant compared to his assailant, btw), and put out the light. He has a coat – he can just throw that over it, if the wick is somehow unquenchable. No light = no shadow fighter. As a professional burglar, it seems likely that Jassart would have exceptional spatial awareness and be able to navigate in near darkness, especially once he’s seen a space in the light. Ha! I was thinking of thrusting his own lantern in front of himself- casting his shadow always away from his assailant. I wonder about the “science” behind the shadow tricks. Seems more like sympathetic magic than alchemy. It looks like an evil magic lantern to me. Can’t remember if it was a Night gallery, Tales from the Darkside, or Hitchcock but I do remember a story like it from when I was a kid trick is just to be at the lantern. Remember she did make a deal about the lantern, shadows need light or something like that. Count your blessings and be glad there’s not a triforce involved. I would like to draw people’s attention to panel 3, the little corner lantern in the background, the pattern on the wall it creates being lit–that is some nice detail right there.